House Minority Leader Nancy Pelosi said she’s under “tremendous pressure” to put global warming at the top of Democrats’ agenda. Pelosi wants to revive a House select committee on global warming, but there’s dissent in her party. Three top Democrats plan on holding their own climate hearings early in 2018. House Minority Leader Nancy Pelosi doubled-down on plans to make global warming a central issue when Democrats take control of the House next year. “It was urgent in 2007. It’s more urgent now,” Pelosi told reporters at a press conference Thursday. “There is tremendous pressure for us to return to that place where the climate issue is preimminent,” Pelosi said of plans to revive the select committee on global warming. Pelosi created the Select Committee on Energy Independence and Global Warming after first becoming speaker in 2007. The committee was responsible for cap-and-trade legislation that failed in the Senate because of a lack of Democratic support. Republicans got rid of the committee in 2011, but Pelosi wants to revive it. Pelosi is confident she will become the next speaker of the House when her party takes control in 2019. 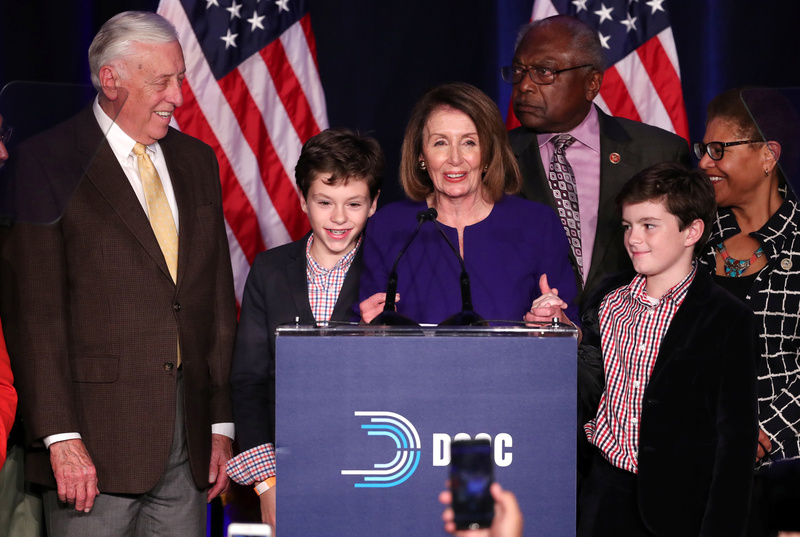 U.S. House Minority Leader Nancy Pelosi celebrates the Democrats winning a majority in the U.S. House of Representatives with House Minority Whip Steny Hoyer (L), her grandsons Thomas and Paul and U.S. Rep. James Clyburn (R-Rear) in the U.S. midterm elections during a Democratic election night party in Washington, U.S. November 6, 2018. REUTERS/Jonathan Ernst. However, Democrats largely ignored global warming during the 2018 election cycle, choosing instead to focus on issues like health care. In fact, voters rejected most global warming-related ballot measures in the recent election. That hasn’t dissuaded environmentalists who see a Democratic House majority as an opportunity to push for global warming legislation. Environmental activists occupied Pelosi’s Capitol Hill office Tuesday, demanding she support a “Green New Deal” to get the U.S. off fossil fuels and onto 100 percent green energy. Incoming New York Congresswoman Alexandria Ocasio-Cortez joined eco-protesters in their effort. 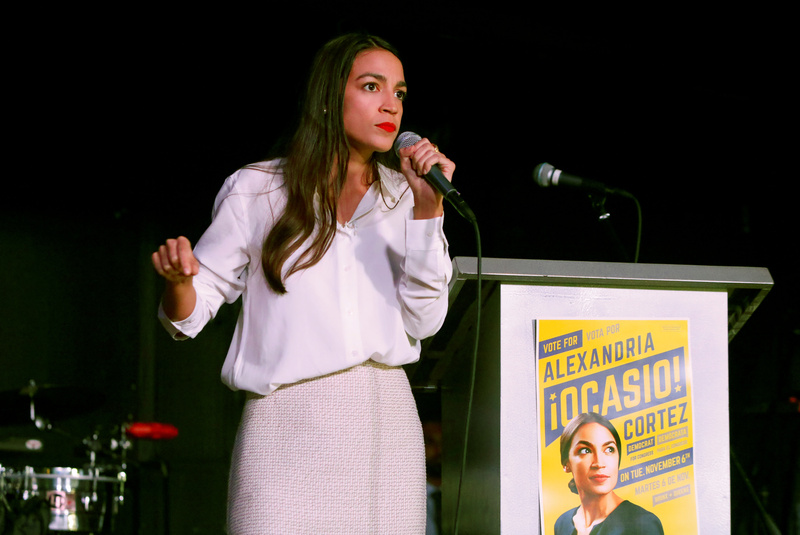 “This is about uplifting the voice and the message that we need a Green New Deal and we need to get to 100 percent renewables because our lives depend on it,” Ocasio-Cortez told reporters that day. However, not all Democrats are in agreement over the creation of a special committee to pass global warming legislation. Democratic Reps. Frank Pallone of New Jersey and Eddie Bernice Johnson of Texas have oppose reviving the select committee, and instead will be using their pending committee chairmanships to plug global warming. “We plan to hit the ground immediately with a series of hearings early in the next Congress on how best to combat this growing global crisis,” Pallone, Johnson and Rep. Raul Grijalva of New Mexico said in a joint statement Wednesday. Pallone will head the Committee on Energy and Commerce, Grijalva is set to chair the Committee on Natural Resources and Johnson will take over the Committee on Science, Space and Technology. “Our committees plan to work closely together to aggressively assess the public health, economic and environmental impacts of climate change and to explore the best solutions to combat this challenge,” said Pallone, Johnson and Grijalva.